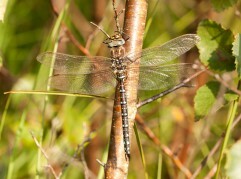 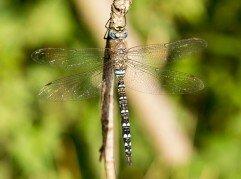 In flight often confused with the related and similarly small Aeshna mixta. 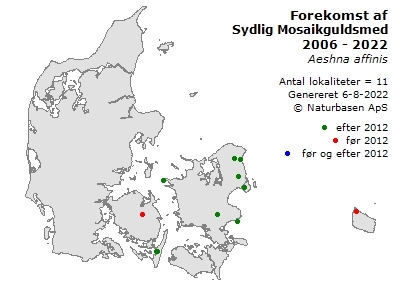 Ranges less far north, but alsomigratory and may be invasive in good summers. 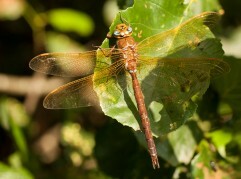 Males are often observed when making low patrols over drying wetlands, showing their noticeable bright colours. 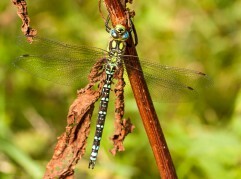 The male’s vivid blue eyes and abdomen and largely green thorax sides are especially distinctive, reminiscent of miniature Anax imperator. 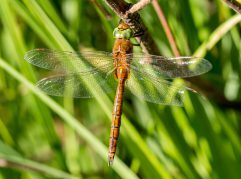 Prefers standing waterbodies that dry up over course of summer, often overgrown with low rushes, bulrushes or reeds.